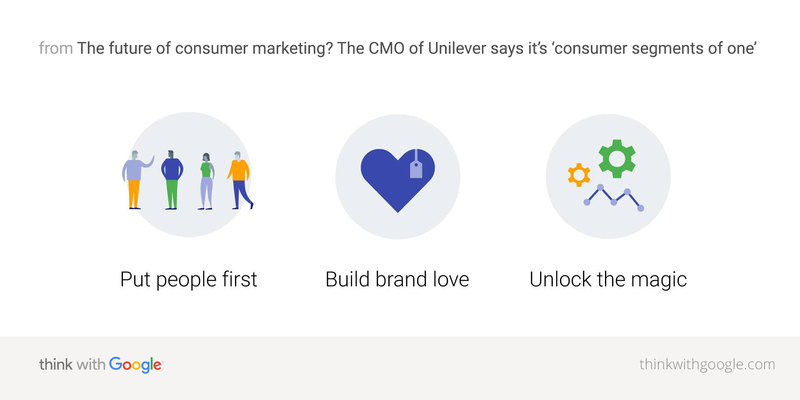 Think with Google’s Guest Editor, Unilever’s Chief Marketing and Communications Officer Keith Weed, shares his perspective on the shift from mass marketing to mass customisation and how brands will adapt. The connected world and the ubiquity of technology have rewritten the rules of building brands, innovation, media, creativity and retail forever. While the internet served as the enabler for this transformation, the real driver has undoubtedly been the mobile phone. Mobile is unlocking consumer control, empowerment,and choice to an extent we have never seen before, driving a hyper-segmentation revolution. As we move from mass marketing to massive customisation – from focusing on averages to individuals – I believe that in the future we will build brands in segments of one. For marketers who have traditionally created and marketed brands to the dominant majority – the largest segment – this means thinking about marketing very differently than in the past. Today’s hyper-empowered, tech-augmented consumers are increasingly in control of the branded messages they receive and how they shop for brands. As moments-that-matter behaviour – where people instinctively turn to their device to act upon a need – becomes the norm, consumers’ expectations of value, convenience and immediacy of response from brands are becoming increasingly demanding. In the future we will build brands in segments of one. Search is absolutely central here, acting as the filter that enables the empowered consumer to get what they want, when they want, wherever they want. People – myself included – can’t remember what it was like not to be able to do things before their mobile was in their pocket. This gives rise to two key characteristics of today’s consumer: immediacy and relevance. 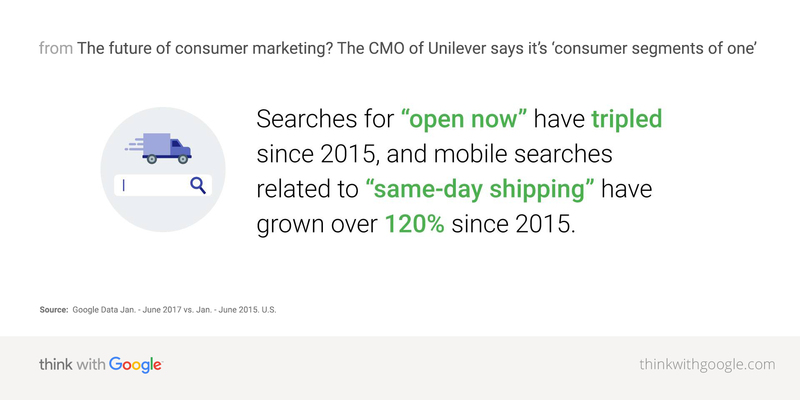 For example, searches for “open now” have tripled since 2015 and mobile searches related to “same-day shipping” have grown over 120% since 2015. And when it comes to relevance, expectation is accelerating rapidly. Since early this year, the volume for local searches without including the specification “near me” have outgrown comparable searches which did include it. Source: Google Data Jan. - June 2017 vs. Jan. - June 2015. U.S.
For brands to be allowed a part in the hyper-empowered consumer’s life, they have to be able to both anticipate and assist with their needs. This means being relevant, tailored, and personal – a huge shift from when brands (especially CPG businesses like Unilever) tended to be built for the masses. And they need to do it all in real time, in context, in the language. At Unilever we have an ambition to have a billion one-to-one relationships – I don’t believe that a focus on the individual has to mean “niche”. There is a huge opportunity here for brands to help simplify lives in this complex world – to make massive choice digestible. Just think about how long it takes you to shop in a foreign supermarket where you don’t know the brands. Similarly, brands can help simplify the online world of seemingly never-ending content to help organise people’s experiences in a connected world. So what should marketers be doing? It can certainly feel daunting and at times overwhelming to face this new world order. But I genuinely believe that there has never been a more exciting time to be in marketing. Still, what does all this mean for marketers in the day to day? In practice, I think it means three things. Put people first. Leverage data to deeply understand the new and complex consumer journey, and be clear where your brand should be present to add the most value. Keep your consumer as the true north to connect with them on a one-to-one basis. Cut through the clutter and build brand love by standing for something meaningful. People don’t just want a product to buy, they want an idea to buy into. Millennials and Gen Z show us time and time again that they want brands rooted in purpose and doing good for the world. Once that purpose is clear, it allows brands to create engaging experiences that sustain a far longer and richer consumer conversation than simply talking about a new product variant or a seasonal promotion. Unlock the magical combination of data-driven consumer understanding and brilliant purpose-led creative to build deep and meaningful one-to-one relationships at scale. Marketing is magic plus logic, art plus science. Never before have we as marketers had the ability for the logic half of the equation that data affords us today. At the same time – as consumer attention is more selective – never before have we had such a need for the magic. At Unilever we have an ambition to have a billion one-to-one relationships – I don’t believe that a focus on the individual has to mean “niche”. Mobile is rewriting communication and commerce, changing the relationship between brands and people forever. And with half of the world still waiting to join the online world, we are only at the foothills of what is possible. The brands that lead this, providing consumers with a frictionless experience online and off, are the brands that will win in the future.